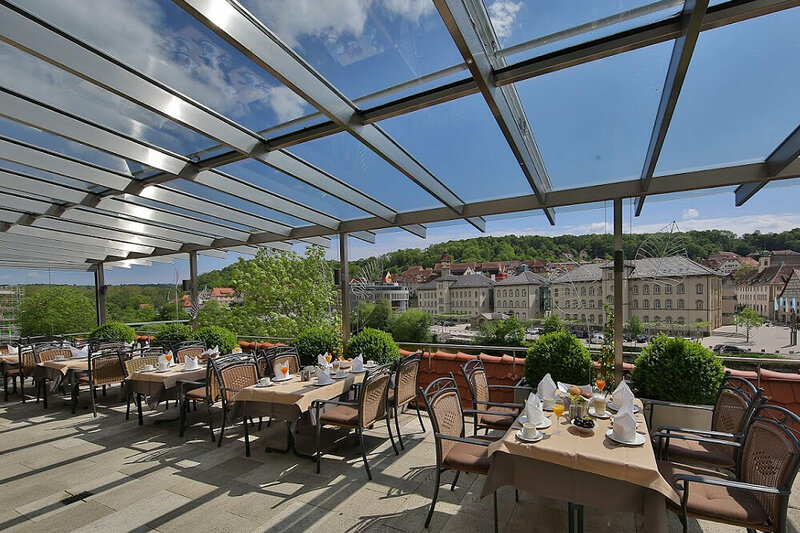 Front-row seats for connoisseurs: the hotel’s culinary heart beats in the elegant Panorama Restaurant, right in the middle of the Hohenlohe roof landscape. 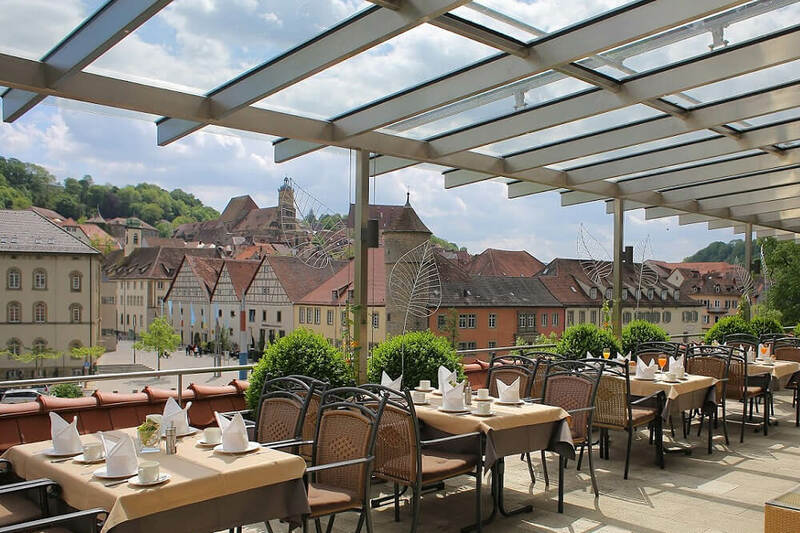 The expansive glass front provides a view of the picturesque Old Town and Kocher Valley, up to the Comburg Monastery. Our team of chefs, Uwe Rahn and Damir Hammel, provide a typically regional and fresh cuisine with an international influence, and have a close association with local suppliers such as the Bäuerliche Erzeugergemeinschaft (Farmers Community) or the Haller Löwenbrauerei (Haller Brewery), as well with local bakers and butchers, organic farmers and wine estates. The wine cellar stores wines from Württemberg, Franconia, Italy and France, with a cellar containing rare wines. The first highlight of the day – breakfast from the buffet daily from 7 a.m. Whether you would like to get up early or sleep late, we cater for everyone. Coffee, tea, fresh fruit juice, muesli and fruit, scrambled eggs, pancakes and home-baked waffles, home-made jams, honey from our own bees, ham and cheese, with smoked salmon and sparkling wine at the weekend and on bank holidays … a huge selection! 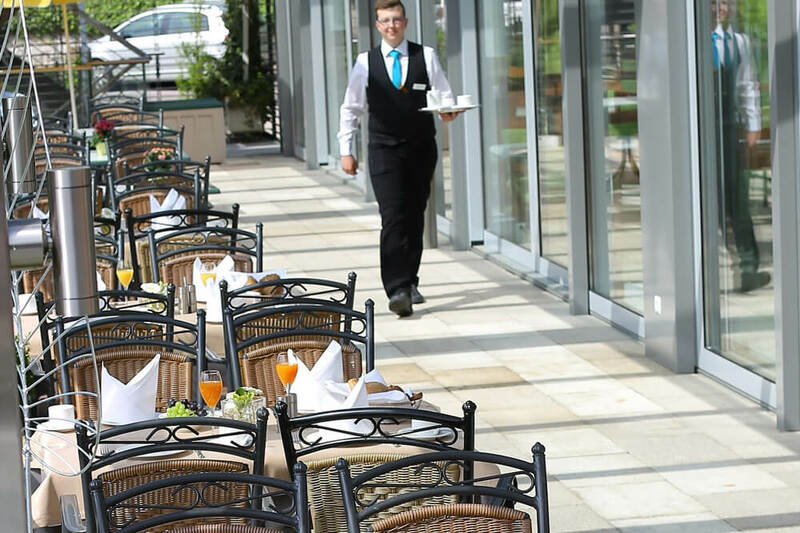 If the weather is good, the buffet is set up on the covered terrace – there is no better way to start the day! For guests who have not spent the night in our hotel we recommend booking a table – especially on Saturdays and Sundays! 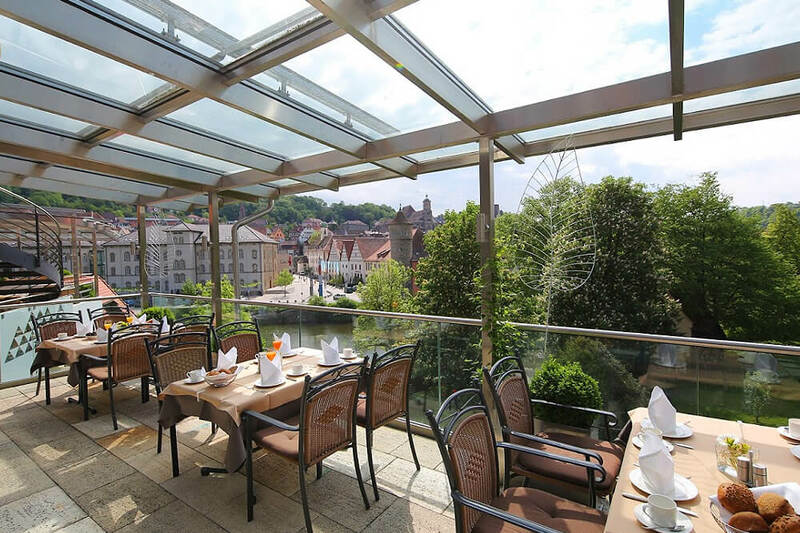 Enjoy the most beautiful view of the medieval town from the glass fronted open-air lounge. The terrace often serves food from 7 a.m. right through to 12 p.m., a popular meeting place for locals, theatre goers and festival visitors from all over the world. Our spectrum of services ranges from our breakfast buffet, an additional lunchtime menu with small dishes, coffee, cake and ice creams, to complete menus, as well as summertime barbecues. To round off the day we recommend you visit the Hohenlohe Bistro Bar. The casual and sociable meeting point for business travelers, holiday makers and friends of the night life, open from 5 p.m. until 1 a.m., provides classy cocktails, wine and whisky, draught beer, fresh fruit juice and a range of coffee specialities. In “jenseits Kochers” you can get sweet and savoury food, delicious soups, light dishes, homemade burgers and the best Currywurst (curried sausage) made from Schwäbisch Hall pork up until 11 p.m., 10 p.m. on Sundays, at a time when nowhere else serves warm meals. Company parties, family celebrations, on a large scale or for a small circle of friends... Engagement or dream wedding, birthday party, club anniversary, a long awaited promotion or any other happy event – anything you would like to celebrate! 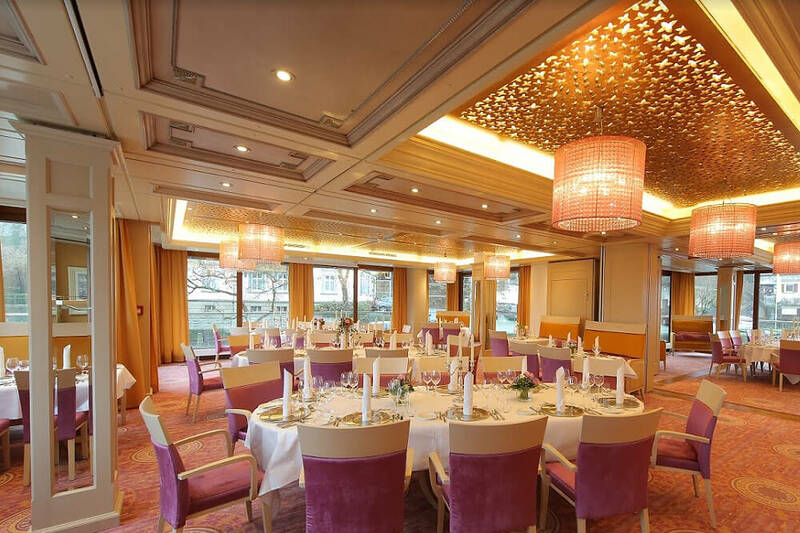 In Hohenlohe we have several modernized banquet rooms in various sizes, some with a roof terrace, for representative events and family celebrations, for up to 120 people. The Bistro Bar “jenseits Kochers” is the ideal venue for merry “After-Work-Parties” with colleagues. During the warmer months of the year, the glass-roofed, open-air lounge, together with the hotel lobby with front cooking station, is an ideal venue for private functions for up to 100 people. The Hohenlohe Catering Service delivers trendy finger food and tasty sandwiches, Schwäbisch Hall favourites, elegant menus or creative (themed) buffets to your home, to your company or to any other location of your choice. If you wish we can also provide drinks, tables and chairs, decoration, cutlery, the service and anything else you might require. You can devote your full attention to your guests, and behind the scenes we ensure that everything runs smoothly. Discretely, professionally. Make the most of our decades of experience in planning and organizing private parties, representative receptions and large scale events for up to 2000 people. Need some support in planning your (golden) Wedding Anniversary? 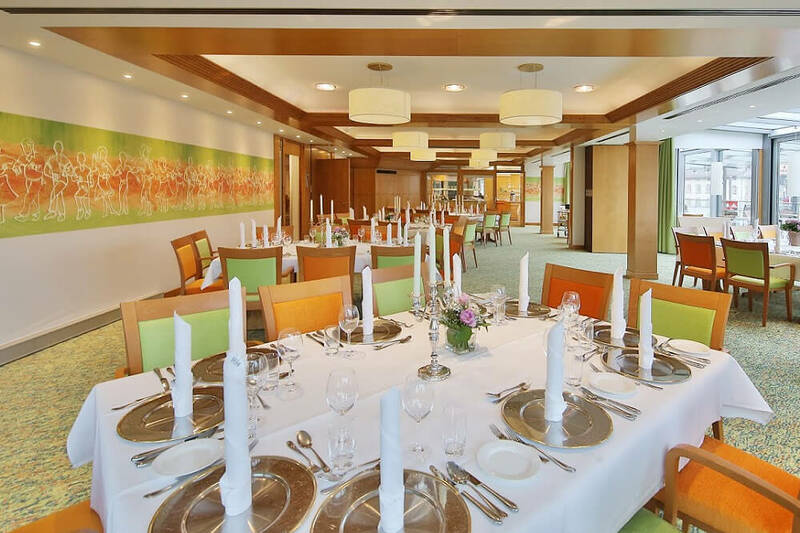 Would you like to book your favourite table in the Panorama Restaurant? Invite friends to an “After-Work-Party” in the “jenseits Kochers” Bistro Bar? Organize Sunday morning breakfast on our sun terrace or simply entertain the whole family at home, in the garden? We have a wealth of experience and know-how, and would be happy to advise you. Just use our contact form or call us (telephone -+49 791 7587-0). We look forward to hearing from you! Word has got around that you can eat and drink especially well in the Hohenloher Land. The best ingredients thrive and prosper practically on our doorstep. At the Ringhotel Hohenlohe we set great store on quality, authenticity and sustainability, trusting our long-standing regional suppliers who share our love of our country and enjoyment. For almost fifty years we have been serving beers from our local brewery, the Haller Löwenbrauerei. The award-winning family brewery uses water from its own source. Traditional manufacturing processes are used, as well as high quality raw materials and slow brewing – for even more enjoyment. The Schwäbisch Hall Farmers’ Community "Bäuerliche Erzeugergemeinschaft"
At the beginning of the eighties, the Schwäbisch Hall Landschwein (pig) was nearly extinct. But today, the “Mohrenköpfle” has become a trademark of the region, as has the BESH premium product “Boeuf de Hohenlohe”. Experience real local enjoyment: the organic hay-milk cheese, produced by the Geifertshofen dairy without any additives, has a unique aroma. The milk used for this is produced by cows which graze on the pastures in the summer and feed on aromatic hay in the winter. His high quality fruit brandies are made from the juicy fruit from local orchards. Marco Hage is also inspired by our local herbs and spice essences, which he turns into the exquisite Hoolgaascht Gin, using Hohenloher wheat brandy as a basic ingredient. Only the best make it to our wine menu:Award winning wines from the Weinkellerei Hohenlohe Fürstenfass, organic Prädikat wines from the Weingutes Fürst Hohenlohe-Öhringen, noble wines from the Weingutes Zipf in Löwenstein, from the Staatsweingutes Weinsberg and the Weingärtnern Cleebronn-Güglingen. Soft boiled eggs, scrambled eggs, fried eggs, delicious pancakes, waffles and homemade pasta ... amazing, the things you can make every day from the fresh eggs laid by happy hens! 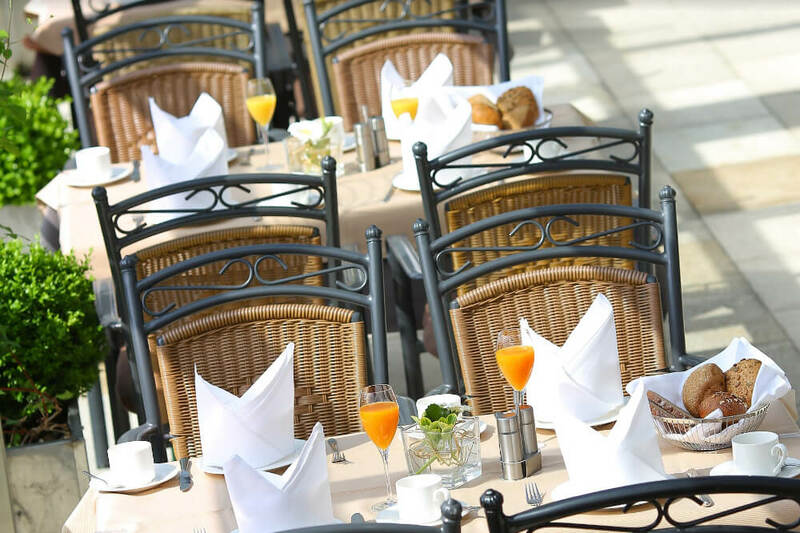 Our breakfast buffet would not be what it is without the fresh rolls, pretzels and various types of bread from the Bäckerei Renner and Backhauses Gräterbakeries. 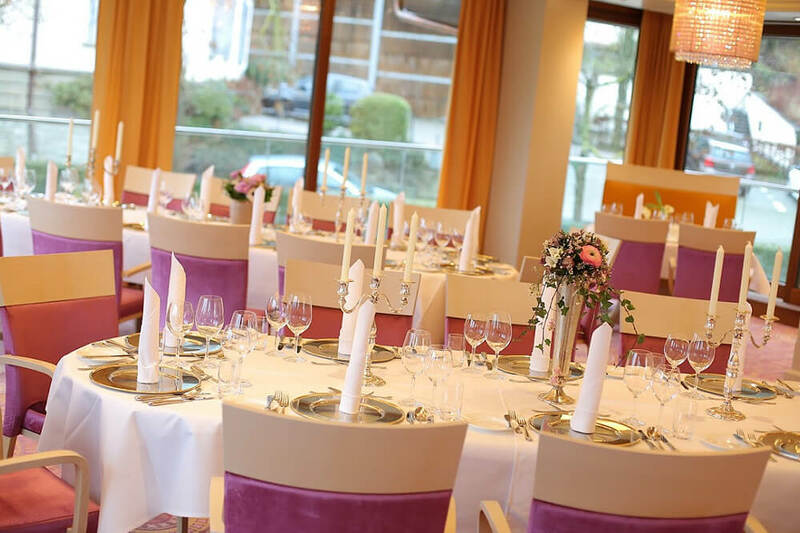 The traditional family-run businesses have delivered to Hohenlohe for decades, and continue to delight our guests with new creations. An abundance of apples, pears, mirabelles – if you love fruit, you are in seventh heaven here. The Haller family business “Hohenloher Fruchtsäfte” produces delicious thirst quenchers and power drinks from all those sweet fruits. Recently we have started to provide hospitality to four bee colonies on the meadow behind the hotel, looked after by beekeeper Matthias Wolf. The busy bees collect nectar for our honey. The whole honeycomb is placed on our breakfast buffet. At the hotel reception, you can buy jars of honey throughout the year.